Baked Vietnamese fries. 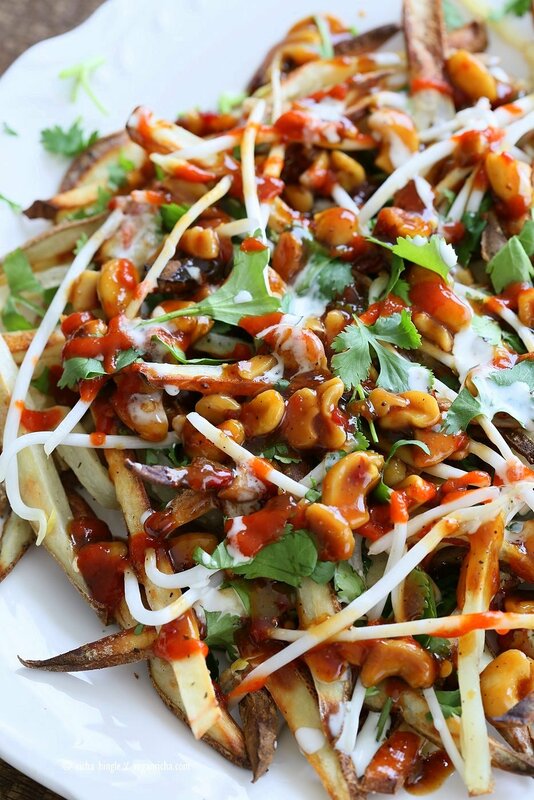 Baked Potato strips, loads of cilantro and basil, bean sprouts, nuts in sweet chile sauce, sriracha and vegan mayo! Banh mi Sandwich in fries form. Vegan Gluten-free Recipe. Pin this post. 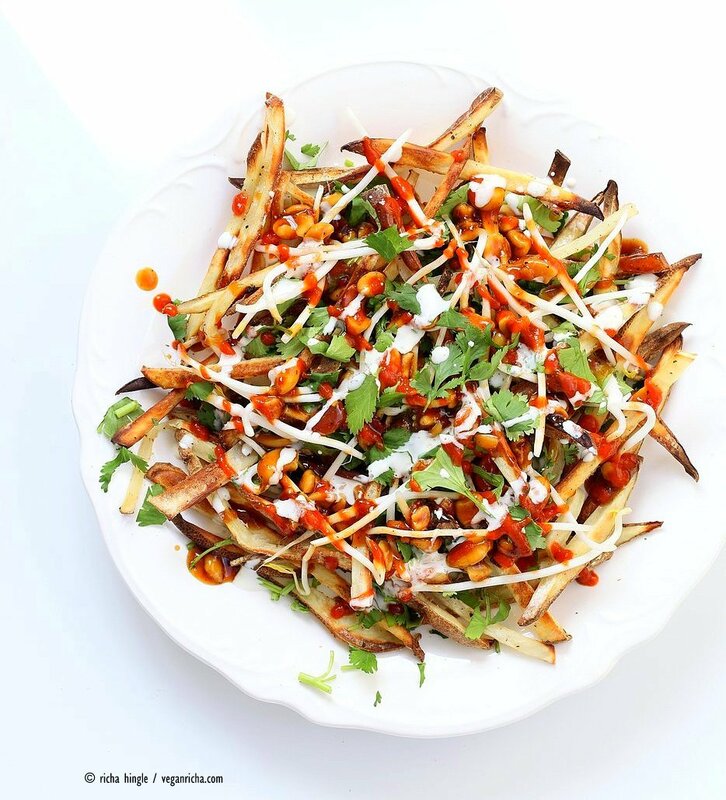 Because what’s not to like in loaded Baked fries with sweet, sour, spicy, nutty, creamy flavors all in one! 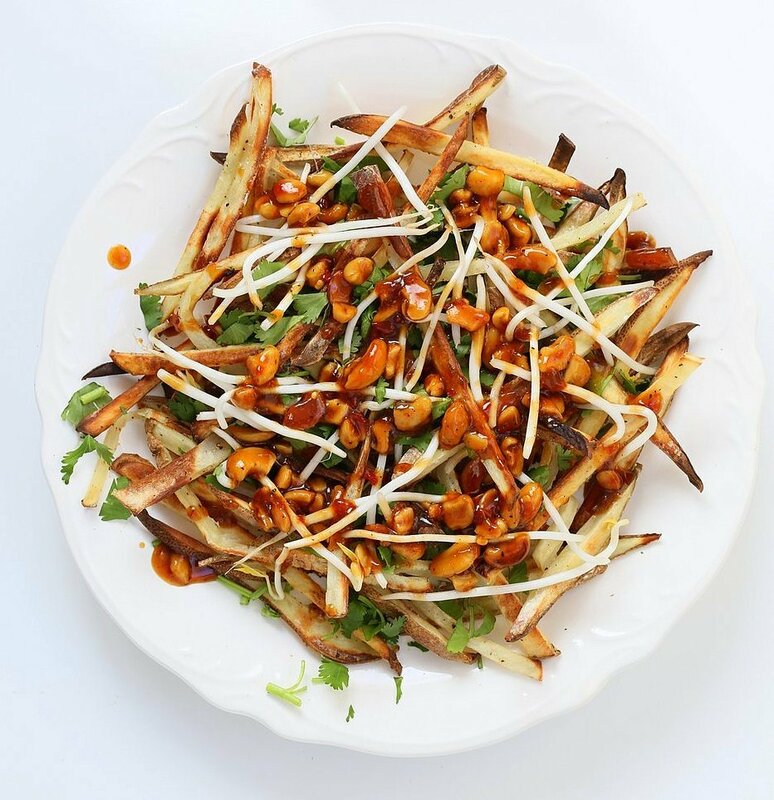 These Vietnamese inspired fries are topped with fresh cilantro, basil, scallions, bean sprouts, sweet spicy sauce, some cashew cream and toasty nuts. Use russet potatoes to make regular fries or sweet potatoes for Sweet potato fries. Prep the sauces and toppings. Bake the fries, layer as you wish and serve. You can also add some crisped up tofu and toss it in the sweet sauce. Fill everything into wraps. Bake the fries. Layer them, then add cilantro and basil. 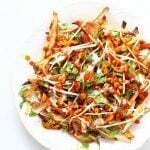 Layer the sprouts and roasted nuts with sweet chili sauce. Add more cilantro, sriracha and vegan mayo or cashew cream. You can also add some pickled carrots or cucumbers. Serve! 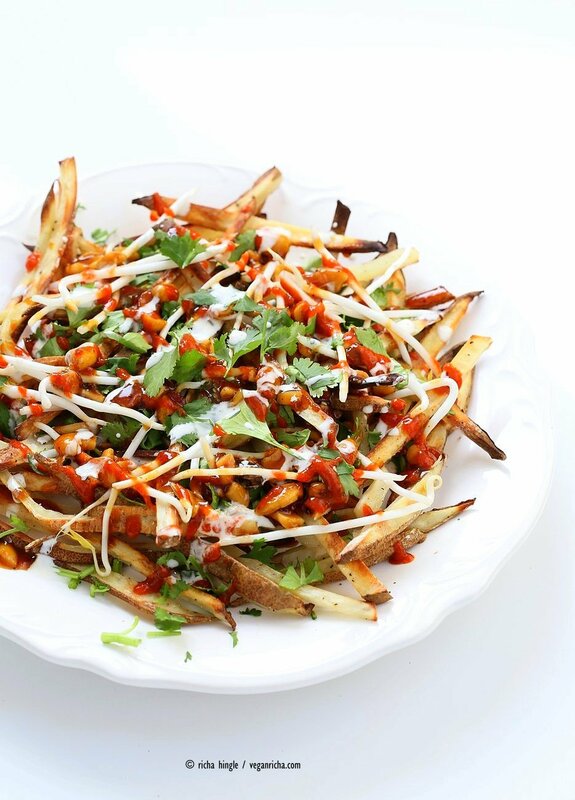 Baked Vietnamese fries. 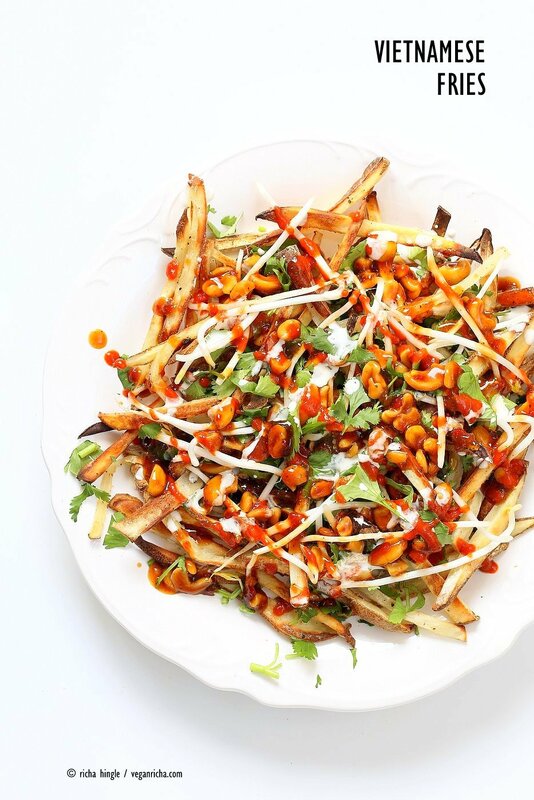 Baked Potato strips, loads of cilantro and basil, bean sprouts, nuts in sweet chile sauce, sriracha and vegan mayo! Banh mi Sandwich as fries. Vegan Gluten-free Recipe. Roast the nuts on a pan over medium low heat until golden (if using unroasted). Mix all the ingredients under sweet chili sauce and bring to boil to thicken. Reserve 1 tbsp of nuts for garnish, and mix the rest with half the sauce. Arrange the fries on a platter. Sprinkle salt, pepper to taste. Layer cilantro and basil. Add a layer of bean sprouts. Add the sauced roasted nuts. Drizzle sriracha, vegan mayo and more of the sweet chili sauce. Add chopped scallions, reserved nuts and more cilantro. Serve warm. Other additions: add shredded carrots or pickled carrots and radish. For quick pickled Carrots and Radish: Mix 1/3 cup rice vinegar 2 to 3 tbsp sugar, 3/4 tsp salt and mix. Add thinly sliced, carrots, radish, cucumber, optionally some green chilies. Refrigerator for an hour and use. Richa, this looks like something I can make a meal out of! Thanks for another enticing recipe! This looks great, I have never seen this dish before and I love food with lots of different flavours and textures going on. Will definately be giving this a try over the weekend. I cannot wait to try this. It’s sure to be another Vegan Richa hit at my house! These fries look amazing! Your recipes are deliciously inspiring! I made these and they are SO good. They have this flavor that I’ve never tasted before! 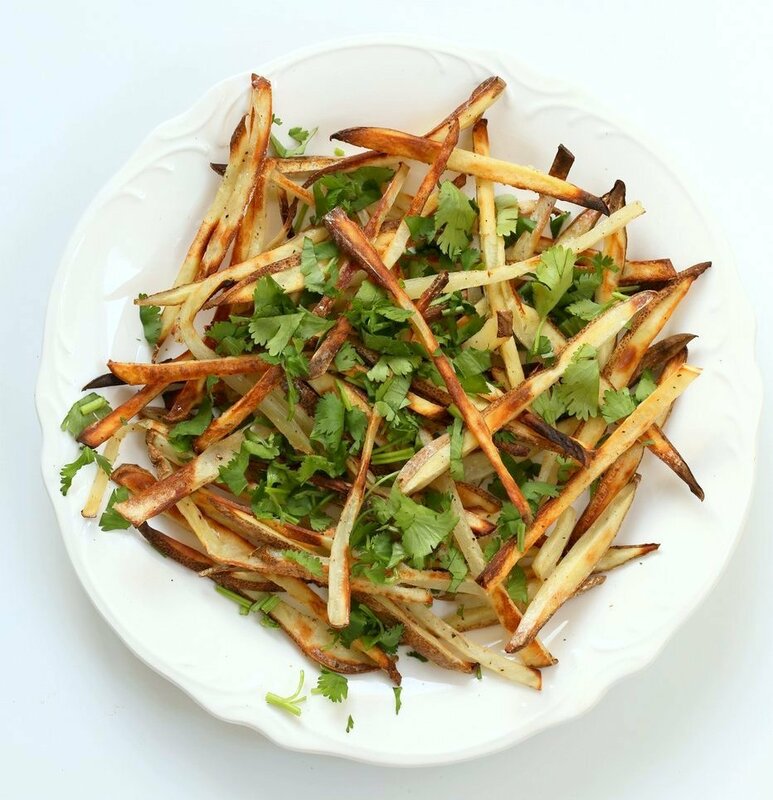 My mother also used to make Vietnamese-style fries! She got this recipe from my grandmother, and I never failed to eat three whole batches of her fries every time! I love the way you topped everything, though! This is awesome! Made these and they are delicious! What could I pair these with for a small dinner party? Look delicious. I will make the recipe to my family. Thank for sharing. Looks delicious but please don’t call this exclusively Vietnamese. Sweet chili sauce makes it Thai. This looks delicious ! Where do you buy bean sprouts? I am from Seattle too, and can not find them in any stores. I get them from whole foods or uwajimaya. Any chance you can add nutritional value to your recipes? Maybe in the future when I can hire someone to do the calculation. or someone volunteers 🙂 . I am looking forward to making this recipe for a dinner party. I am from India and I was wondering what is Asian Chili Sauce. Basically, I can’t get Sambhal Oelek here and don’t know what to substitute it with exactly. Please tell me its alternative. It would be of tremendous help. you can use the regular chili garlic sauce or a hot and sweet sauce instead.